The Memorial, which was originally erected in the form of a drinking fountain, commemorates those who died in service or were killed in action during World War One. The fountain is no longer functioning. The memorial is a white marble cupola over a granite basin on a bluestone plinth on a two-stepped bluestone base. 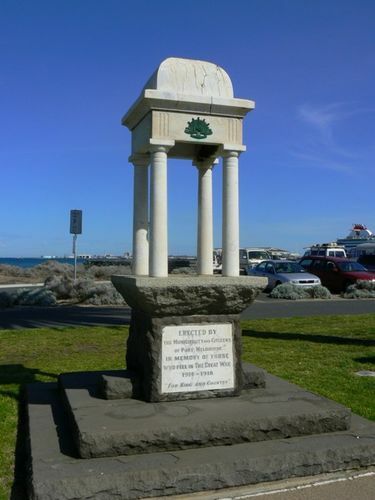 Port Melbourne Council has under consideration plans for erecting a war memorial drinking fountain on Sinclair parade (on the beach) at a cost of £250. A mosque design is favored. The local branch of the Soldiers' Fathers' Association raised a considerable portion of the money. Very soon after the war, Port Council gave the local branch of the Returned Soldiers' League the Excelsior Hall for a club house. The war memorial bandstand on the beach is a gift from the Women's Welcome Home Committee. Record (Emerald Hill), 11 April 1925.